Add the peas and cook for another minute. 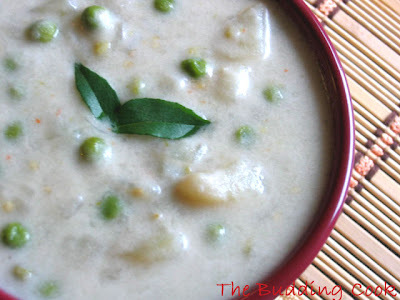 Serve hot with appams or rice. Nice picture and a simple recipe. I've done only potato stew. will try it with a combo of vegees soon. mmmm...looks absolutely comforting and delicious! I love Vegetale Stew and aapam.. i add other vegs too like carrots and beans besides potato and peas. Appam and stew never go out of style, do they? Wow! what a simple vegetable stew. Never tried. Its tempting. Will try soon. Thanks for sharing tbc. Apam with stew is one of my favourite combinations...thanks for the lovely recipe...stew looks gr8! Your stew looks delicious....perfect to warm you up in this fall weather! Gorgeous looking stew! Can i have some, please (and an appam or two) :-D.
lovely looking stew! but is goya brand good? I got coconut milk, dont remember which brand but the smell of the milk overpowered. does it give good taste. Lovely looking stew,Tbc..Love the combo of spring onion and tomato.. So you made tose lovely looking fritters for JFI..Eh...E-envy..as I am still hunting for the fruit!!:).. You are reallly improving with the presentation! !..keep it up! A big, easy bowl of thick, creamy potato, just the thing for moving into the cooler seasons, although I eat soups and stews any time of year. A very pretty, simply wrought photo, my favorite kind. Nice stew, i like to eat them with appom. When i make stew i add a cinamon stick,pepercorns,cloves etc. Which gives a nice aroma also. I am sure the coconut makes that sweet and rich. That's so interesting, I have never seen curry leaves, not sure if I can get it here, and I am sure it adds so much to this dish. As for the coconut milk, oh I can almost feel the flavor, we have many dishes here that take it. Dp you think I could use chickpeas instead of peas? Thanks! I add those veggies too but this was all I had on hand that day. I love Goya brand and only use this.I have tried a couple of other brands before but have never found one I liked till I started using Goya.It tastes really good, very rich & creamy, but you have to ccook on medium heat for a little while till it thickens. I have also tried using coconut powder & adding water to it but I don't usually do that unless there is no Goya. As for the smell, I actually like it as it cooks. I am glad you clicked on the link.I liked the way they have described making a few preparations and wanted to share it. Hope you have found something for JFI. Did u not post some plantain chips earlier on? I too don't let seasons dictate what I should/should not eat:-). Do try this out. You could cut down on the number of chillies used. I know a lot of people add the things you add. But I like to use just chillies & lots of curry leaves for the flavor. Cynthia, yes it does. You just have to make sure that you cook it for a long time till it gets thick & creamy. Kajal, try using coconut milk, you will like it. Is that all? You made is very simple. Love this stew. Thanks for the post. Seec, yes...minimum number of ingredients but great taste! few days ago i was searching for this recipe, but i didnt find anythg interesting.. now i found this in ur blog, i book marked it.. thanks!